Retirement planning is not generally a topic that gets a lot of attention in the streaming space. After all, it’s pretty boring, the industry is relatively new so the focus has been on monetization, and it’s complex. Hopefully, this article clears up some of the reasons you should consider saving for retirement. If you want an in-depth discussion of your options for retirement savings, check out this article I wrote. There are two important things to consider here. First, this is generally geared towards a US audience. Second, this is a discussion that’s best carried out in collaboration with a financial planner and accountant. There’s a lot you can do that’s good but it often pays to get help so you absolutely nail it. Regardless of if you’re a streamer or viewer there are good reasons to consider saving for retirement. First, odds are you’re going to be responsible for providing your own income when you retire or are no longer able to work. Social security and other systems designed to provide income are underfunded. They’ll likely have to see a reduction of benefits. Similarly, employers have offered less and less generous retirement plans over time. Long gone are the days of the company pension which pays you 60%+ of your salary once you retire. Second, the sooner you start the better you’ll do over the long term. It’s simple but powerful math. Third, it can help you save on taxes. This could either be reducing the taxes you owe today or avoiding taxes (legally) in the future. Saving on taxes generally gives you more money over the long term. That’s a good thing! Finally, just the act of building good savings habits can help you save more in other parts of your life. If you’re able to align your spending with your values you’re more likely to find some contentment. It can be its own reward! Everyone can access an individual retirement account (IRA). There are two main types of IRA: traditional and Roth. A traditional IRA saves pre-tax money which reduces what you own in taxes today. A Roth uses post-tax money and lets you avoid taxation in the future. In either case, you can save $5,500 per year (with an extra $1,000 annually if you’re over age 50). If you’re a part-time streamer there’s a chance that you have a retirement account available to you through your job. You don’t get much of a say in the type of account but often you do get a say in how much goes into it. 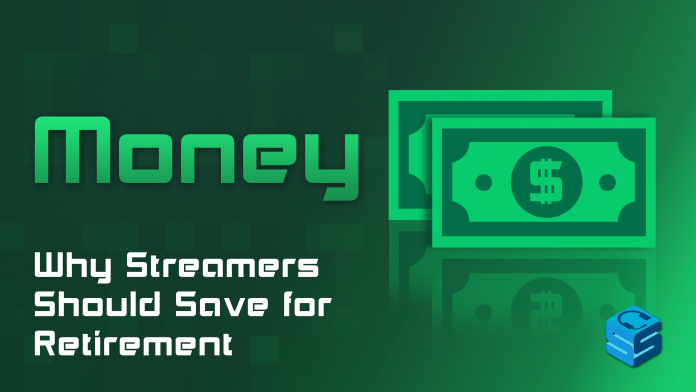 Depending on how much you’re earning from Twitch and if you need it to cover your bills, it could make sense to defer what you make from streaming into those accounts. If you don’t have a plan through your job, there are some basic types of accounts (like a SIMPLE IRA) that are very easy to set up and let you save on your own. If nothing else it can help you avoid having to make quarterly tax payments! Here, the focus should be on minimizing the hassle of your retirement savings. If you’re not earning enough to go full time it doesn’t make sense to add a ton of complexity with a retirement account. Just go for simple, but effective. This is where things get messy. Since you have your own business and derive the majority of your income from that business you HAVE to make smart decisions. Fortunately and unfortunately, you have a ton of options. This is fortunate because you get the chance to pick exactly the right plan for you. The world is your oyster! It’s also unfortunate because it means you need to do a lot of research and consider a lot of options. That can be exhausting and overwhelming. As a full-time streamer, you’re likely past considering a SIMPLE IRA. Now the question becomes whether or not a solo 401(k) or a SEP IRA makes the most sense. My in-depth article on retirement for streamers explains these in more detail. A SEP is easier to set up but lets you contribute less at lower income levels. A 401(k) is harder to set up but lets you save more until you’re earning several hundred thousand dollars. Additionally, with a 401(k) you can go for Roth savings which can make for awesome tax reduction in the future. If you’re earning several hundred thousands of dollars and think that you will for the foreseeable future, it could make sense to start a defined benefit pension. I think this is unlikely but you never know. All in all, a retirement account can help you dramatically reduce what you owe in taxes during your prime earning years. That adds up. Opt for control. If you have two similar choices the one that gives you more control is generally better. As much as possible, avoid fees. If investment returns build your account, fees will eat away at them. Invest for the long term. If you’re saving for retirement you’re likely not touching the money for 20+ years. You can go quite aggressive with your investing and likely have it work out. Save a little bit more than you’re comfortable with. We’re inclined to want to spend more today at the expense of the future. That’s because we live in the present. Buck that trend and up your savings! Set up an automatic savings plan so it’s out of sight, out of mind. This relates to the point above. If you make a smart, rational decision on your savings today make sure that it’s implemented without needing further input from you. That way, you don’t give yourself the chance to mess it up. Retirement savings is a complex topic that’s made even more complex, but flexible, as a business owner. In general, you want to save earlier, save a little more than you want, and plan for providing your own support in the long run.